We recommend measuring your dog before buying, please don’t guess! Our sizes go on actual measurements rather than a breed guide as the key to a good, comfy fit is getting the right size dog harness for your dog. We also make all our harnesses in custom sizes and made to measure. Custom sizes – you measure with our guidance on the phone with us talking you through it or emailing you detailed instructions. Made to Measure is when we measure your dog at our premises. To measure you will need a soft tape measure (not a steel one) and it is best to have your dog standing up squarely. Make a note of measurements in cm as our sizes are in cms. The chest measurement, sometimes also known as ‘girth’ is taking the tape measure right under your dog’s body at the fullest point in a complete circle about 7cm behind your dog’s front legs, as in the diagram. 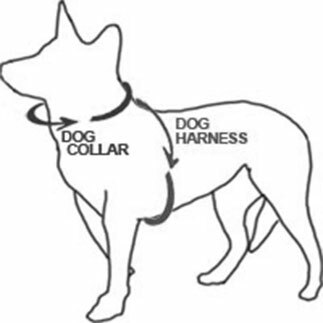 The actual neck measurement is required too (don’t allow for any fingers under the collar, the actual measurement is needed – the neck measurement is only required for being able to comfortably fit the harness over the head. Measure TIGHTLY and at the bottom of the neck. Be sure to measure your dog with care, as the secret to getting a well-fitting and therefore comfy dog harness is selecting the right size! Kindly measure both girth and neck (where a dog collar would sit, do not allow for any extra). See diagram above. Next check the girth span on the size chart. Your dog should always have at least 7cm spare on the girth – i.e. if your dog measures 63cm girth, you will need a size which goes to 70cm girth. The neck measurement is only to enable you to fit the harness over your dog’s head, as the harness straps sit on your dog’s shoulders. Bear in mind whether your dog is still growing. If you don’t see your dog’s measurements there, just order the nearest in size and enter your actual measurements into the special instructions box – we shall need a valid email address or phone number to contact you. Please measure your dog carefully, as the secret to getting the perfect fit harness is ordering the correct size! You should measure both girth and neck. If in doubt, you are welcome to call us or send us both actual measurements and also let us know whether your dog is still growing or fully grown so that we can advise on size, between our 2 brands, your dog will undoubtedly fit into at least one of our fleece dog harnesses. If your dog is a deep-chested breed such as a Whippett,Lurcher etc., please tell us, as your dog will need a deep chested size which we can make. Undo the clips on the new harness and if your dog has another adjustable harness, lay the fleece harness over it and adjust to the same size, as a guide. If you don’t have another harness, just put it onto your dog as it is (clips undone), over-the-head, then closing the two parachute clips, making any adjustment as necessary on either side of the girth strap. A dog harness should fit snuggly but not restrictively, if it is too loose it can rub and cause chafing and possibly sore areas and means your dog may be able to escape out of it. You should be able to get one finger under both side girth straps of the harness. Your dog should be able to do everything as normal in it. A badly fitted dog harness is the main reason dogs sometimes escape out of them, which can be dangerous if they run off, so following these tips should ensure that can’t happen. How to measure for a dog collar, just right round in a circle and add 5cm for comfort to get correct size. A dog collar should not be too tight, make sure you can get two fingers under the collar comfortably when fitted. If your dog is still growing, make sure you check and adjust collar and harness regularly.